Brew Like a Monk (BLAM) by Stan Hieronymus is a book that has revolutionized the way American homebrewers brew Trappist style beers. It focuses on the six Belgian styles produced by Belgian Trappist and Abbey breweries, Dubbels, Tripels, Strong Darks, Strong Goldens, Blondes, and Belgian Specialties (like Orval). Brewing like a monk does not necessarily mean brewing clones of their beers, it mean brewing with simple recipes, locally available ingredients, and to taste (not necessarily style). The two major tenets of the book are to make your beer dry enough (by using the right grain, mash, yeast, and sugar) and to get the right yeast character (by fermenting at the right temperature with the right strain). There are plenty of other suggestions, but these are the two most important concepts in making beers like the ones you buy from Belgium. Content: BLAM starts off with a brief introduction where the author covers what Trappist beer really means, and the history of homebrewing Belgian styles (including a funny Chimay Red clone from 1978 that calls for among other things black patent, brown sugar, and regular dried brewer's yeast). The first two chapters cover the Trappist beers on the market today. The first is a history of monastic brewing in Belgium, including a surprising look at how young some of these beer styles are. The second chapter is a great look at the six Belgian Trappist breweries, Orval, Westmalle, Rochefort, Westvleteren, Achel, and Chimay and their beers (including the seldom discussed Petite Orval and Chimay Dorée). Hieronymus covers the history of each brewery and the development of their beers over the years. The basic stats (OG/FG/IBU/SRM) for each beer are given, and one beer from each brewery is given a full profile with malt/yeast/fermentation/packaging (although some of the info differs slightly from the basic stats, probably because the analysis was done at different times). The information is terrific for anyone looking to clone the beers with a full profile, but I wish he had gone to the same length for every one of the beers, as combined the Trappists only brew fewer than 20 beers. The next four chapters are similar to the second but cover abbey (beers with monastic backing), Belgian, and American interpretations of the Trappist styles. La Trappe, which has since regained its Trappist designation, is briefly discussed in the abbey ales chapter. These chapters contain brewery and beer profiles that are solid, but not as deep as the Trappist chapter. Beers covered in depth include Duvel, Affligem Blonde, Nostradamus, Grand Cru of the Emperor, St. Bernardus 12, Ommegang, and Damnation. The quick look at these other breweries probably won't give you much new info if you are already a Belgian beer nerd, but if you aren't there will be plenty of interesting tidbits. The rest of the book is devoted to the production of the various Trappist styles at home. It starts off with a discussion of water profiles (including the numbers for wells located close to each of the Trappist breweries). Then malt selection is covered, most of which (Dingemans and Castle) are widely available these days in America. It is interesting to read the different tactics brewers use when selecting their malt bills. Sugars are covered in detail, from the worthlessness of clear candi sugar (it is pure sucrose just like table sugar according to the tests Victory Brewing had run on it) to unrefined and caramelized options. Despite its depth this section is devoted to replacing the flavor of dark candi syrup (which was not available in the States at the time), with the current availability of Dark Candi's products much of this information about sugars is more interesting for doing things besides replicating authentic Belgian flavors. Hops are covered briefly, the gist is that most of the breweries use continental hops, but a few have cut costs by using high alpha acid varieties from the Pacific Northwest. The general advice is not to make the beer too hoppy, but that often fresh they do have more hop character than what we taste after they sit for a few months during shipping. For the spice section the main advice is to avoid using them at a detectable level. Farmhouse Ales is a better source for using spices in Belgian beers as they are more common in Saisions than in the styles covered here. Next comes one of the best chapters, Yeast and Fermentation. It contains information about which commercial strains come from which Trappist breweries, and has great charts that give the expected flavors from fermenting both Wyeast and White Labs strains at different temperature ranges. The general suggestion is to start most strains off cool, then let the temperature ramp up as fermentation progresses. This regiment lowers the production of fusel alcohols (a common homebrew problem) while encouraging strong attenuation and ester formation. I particularly like the chart of the differences between the three Trappist breweries (Westvleteren, Achel, and Westmalle) which all use the same yeast, but with different fermentation temperatures. The next chapter covers bottle conditioning (only a couple Trappist beers are ever kegged). The main advice is to re-yeast, and give them plenty of priming sugar to get higher carbonation than you would for most other styles (for safety this requires getting some thicker glass bottles if you want to match the 4+ volumes that many breweries aim for). It is also common practice to let the beers carbonate in a warm room to speed up the process. The last chapter before the recipes covers what American homebrewers most often mess up when they try to brew these styles (or at least were before BLAM was written). Some of it is also aimed at judges who do not appreciate the wide variety of commercial beers that are grouped together in a single style. Accuracy: This is a well researched and well edited book. I only have a few minor points of correction. I would advise against trying the method for making dark candi sugar at home provided on page 169. The flavor is good, but the sugar is nearly unfermentable. The problem is that it starts with Karo which contains quite a bit of dextrin (which are too long for yeast to ferment). I wish the book did a better job explaining that the percentage of sugar listed in various places is by extract, not by weight (I remember spending quite awhile trying to figure that out at one point). Recipes: The final chapter presents the recipes. There is a great summary on pages 221-223 which lists the main take away points of the book, I often reread these pages before formulating any Belgian recipe. Like Wild Brews most of the recipes are presented in a loose form, but comes with a larger discussion of how to brew the style before getting to the recipe. Three of the recipes are from commercial brewers (Vinnie Cilurzo, Tomme Arthur, and Ron Jeffries), and three are from homebrewers. The recipes all look pretty good, and I have based several recipes off them with good results. I do find it odd though that in a book that preaches simplicity in recipe design it has a dubbel recipe with eight malts and a dark strong with six. The beer profiles scattered through the book are also a good resource for designing your own recipes. If there is a beer featured that you want to clone or imitate a characteristic of it help to look at the malt/hop profile. Readability: I think this book is well put together, and clearly heavily influenced by Designing Great Beers. The charts are well done particularly the incidence/average malt usage ones for each style in the recipe section. The book does a good job telling a story and making you want to brew innovative flavor driven beers, but still somehow stick to the monastic roots of the styles. I am not a big fan of the way some beer profiles are splattered through chapters besides the ones focusing on breweries and commercial beers, this can lead to some unnecessary page flipping. I think the book could use a few more sub-headers in each chapter to make finding specific sections a bit easier. 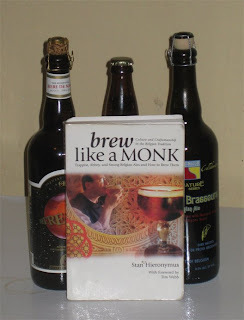 Overall: Brew Like a Monk is a must read/own for anyone interested in Belgian beer. I have recently been flipping through Jackson's 6th (and final) edition of Great Beers of Belgium and I have been disappointed how little he goes into the process of making the beers. If you are interested in recipe design and the day to day workings of Belgian breweries this is the book to pick up. This is another book that has a weak spine, so be gentler with your copy than I have been with mine. Stan Hieronymus also maintains a blog that covers the Belgian beer scene in America that is worth checking out (although it isn't updated very regularly). Excellent reviews. I like that you're willing to point out the flaws rather than take all these books as dogma as so many homebrewers seem to do. I agree that this book is a must read. I cut my beer drinking teeth as an exchange student in Germany, and as a result of that, I really looked down on Belgian beers in general. This book changed the way I think about beer. I thing the most interesting part that he illustrates is how much character you can get with limited ingredients. It doesn't really show that in the recipes chapter, but all you have to do is re-read the Duvel section to have that point really driven home. Glad my thoughts seem to be in line with what you guys think about this book. I’m trying to be as honest as I can in these reviews, but it can be tough to remember what you didn’t know before you read something. Looks like Mosher’s Radical Brewing is going to be next week’s review. Great Review! I have been reading and re-reading BLAM basically since I started brewing (a short) 2 years ago. The assessment is right on - the ideas of the book are rock solid but organization could be a little better. Having all the relevant charts together or consolidated at the end would be nice. Overall, the book is outstanding and improved my brewing skills in general. 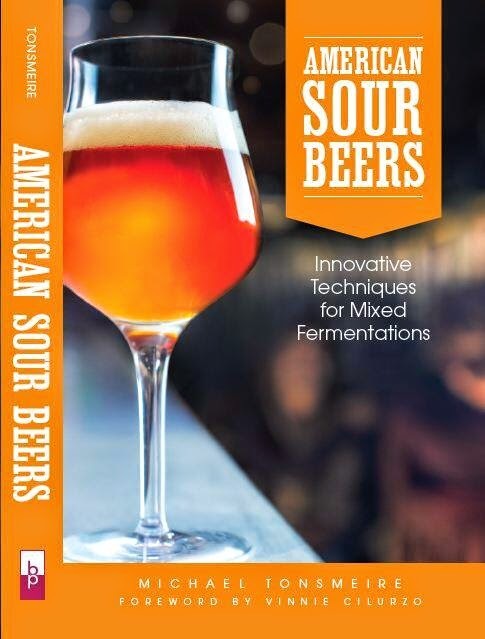 My favorite quote from this book (page 210) is from Jean-Marie Rock, brewing director at Orval: "Before copying Belgian brewers or Belgian methods, tell the American brewers that they have to produce a specific beer made for the American people." Okay, so maybe it was taken out of context, but my initial reaction was, WTF! Has this by been living in a cave for the last 25 years? He's never once in his life tasted Sierra Nevada Pale Ale, for instance? Not to mention beers styles like American Pilsner, or Steam Beer, or any of the other styles that were alive and well even before prohibition? Somebody needs to send this guy a mixer sixer, to let him know that American craft brewing is alive and well, and yes, we love drinking and making Belgian style beers, but we also have our own thing going on here, thank you very much! Mike, excellent review. These book has replaced "Designing Great Beers" as my fall-asleep book. Revolutionary and inspiring. Seanywonton, I mean he just trying to say that american should think about the american people when brewing belgian-inspired ales. I´m sure Jean-Marie Rock knows about Sierra Nevada, Anchor, Stone and the many indigenous styles been brewed in America.